The term ‘Sick Building Syndrome’ was introduced in the 1980s and was initially used to describe offices with poor ventilation, high levels of electrical equipment, fluorescent lights, poor design and bad maintenance. Albeit not recognised when Sick Building Syndrome was being named, Geopathic Stress has since been noted as a contributory factor to the health of a building. So what exactly is Geopathic Stress? Research in to it started as early as the 1900s with Baron Von Pohl from Germany claiming that cancer was caused by negative energy currents under the bed of sufferers of the disease. Continued research found Dr Ernst Hartmann discovering the earth being covered with a grid of invisible power lines, some six to eight feet apart, and that anyone sleeping over a convergence of these lines with other geological factors would cause ill health. The energy grid he discovered is known as the Hartmann Grid. Suzi has been a member of the British Society of Dowsers for 14 years. 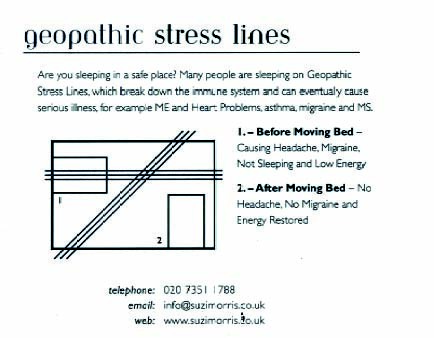 When she visits your home or workplace she uses her dowsing rods to detect areas of geopathic stress or leylines and advises on the repositioning of work, relaxation and sleeping areas within each room. Suzi works on a case by case basis so whatever your health concerns, rest assured that it is handled with sensitivity and in complete confidence. T: 44 (0) 207 3511788 44 (0) 7786 900 713 or email: info@suzimorris.co.uk. The whole process can take about 2 hours, but longer for larger properties.